Okay, here it is, our first grocery shopping of the new year. And we did it on the coldest day that I can remember. It was -26 C (about -15 F for those of you who might be metrically challenged) according to the readout in the truck but it was at least nice and sunny. It almost seems pleasant now because it is storming outside again today. The wind and snow are bad enough that they have sent everyone home from work. Good thing I'm still on holidays! I’m just hoping the electricity stays on. The first groceries of 2014. It was nice that I got to go shopping, though. 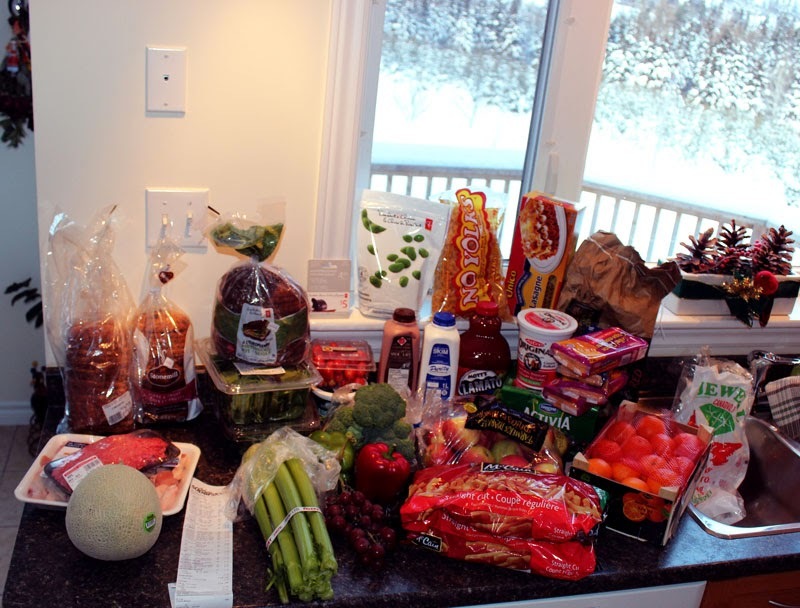 Usually, Hubby does the shopping by himself after work so that we can avoid having to go on the weekend. I love reading labels and squeezing produce but he really gets grumpy if we have to fight the crowds to check out. 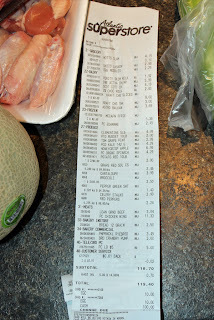 So we had a nice afternoon at the Superstore and I got some healthy ingredients for my new diet. Have a look at that picture, not a single bit of junk except for the oven fries and the cheese slices and those are all Hubby's! The cheese slices were on sale, $3.00 instead of $6.99 so it was a great time to stock up. I don’t use them very much but Hubby has them in sandwiches all the time. The veggies are always a staple in our house but I purchased more because of the new diet. 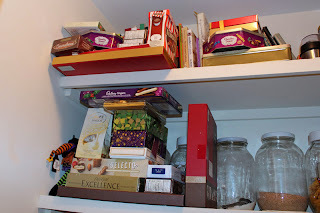 The pantry, as you can see, is full of temptation from Hubby’s well wishers this Christmas. I think they are trying to kill us with kindness. 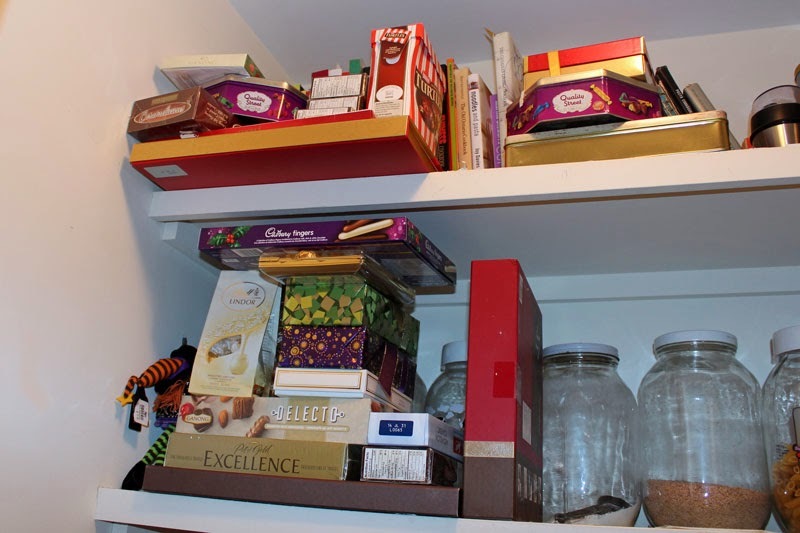 These I will have to remove from my view because there is so many good chocolates calling my name. They will make excellent Games Night prizes. After the madness of the Christmas spending spree we're back to budgeting. I'm serious about paying of our mortgage this year. We figure that if we can put down $5000 against the principal this year, we can be done by November. This sounds more than doable. We have both cashed out our banked overtime (hundreds of hours each) and will use that, with some savings, to fund this year's RRSP contribution. The tax rebate will be used to pay down the mortgage. 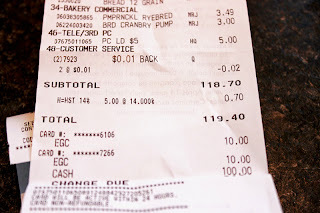 With that in mind, I spent some time earlier looking for a way to track our spending. 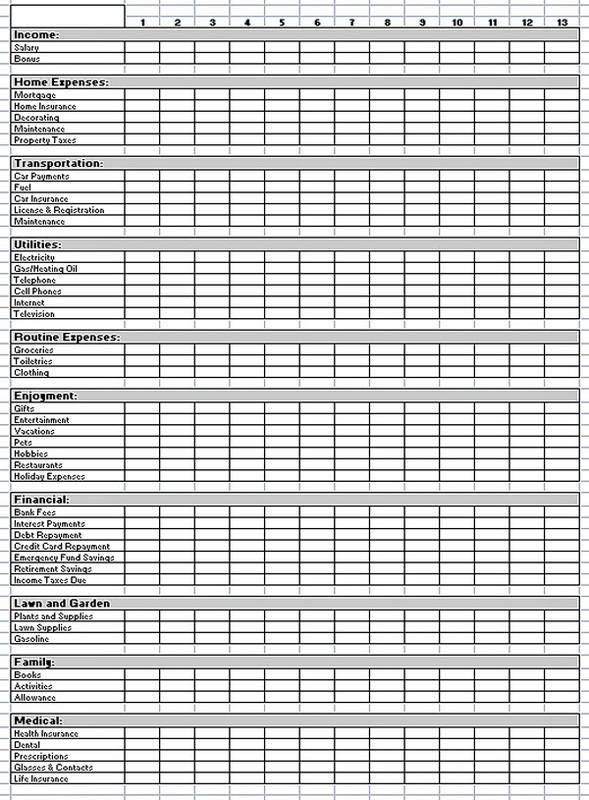 I found a good spreadsheet on Sqawkfox's site to analyze my monthly and annual spending and Hubby made one using mostly her categories to track daily spending. 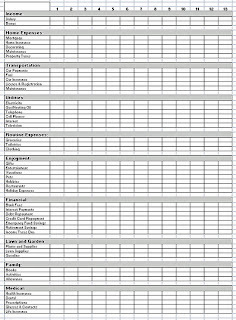 Now I just need to be diligent in filling in what we spend everyday. Retirement is still on the near horizon and I have to know how much we'll need to survive. So, the diet starts on January 6. That's when I return to work. Unless I win the lottery, then I’ll just jump for joy and book a flight somewhere warm and toasty. Of course I’ll have to buy a new bathing suit. No, forget the suits, we’ll go to a private beach where no suits are required. Oh to dream as it’s storming outside and everything is closed. Hope you are all safe and sound and your vehicle starts. I did the groceries last night too and holy cow was it ever cold. Near bout froze my hands bringing the bags into the house. If either of us win the lottery how about we just ship everyone on the island to a more tropical locale? If we only paid the bridge fare per person it would still cost 6.3 million. It had better be a BIG jackpot! Laughed when I saw your chocolate stash!! I was going to quit eating them on January 2nd, then I was given a beautiful box of Ferrero Rochers (48 of them!!). Love new years, new beginnings... hate the weather we've been having though!! Bracing for freezing rain tomorrow, ugh. It's been wicked cold here, too, so on the really cold days, i try to keep my outdoor time to short bursts. I did make the exception with shovelling, as i wanted to be sure i got it all cleared before it froze in place. I am busily eating up all the chocolates and other tempting items so i can return to more of a whole foods diet. Usually, i'm okay with unopened goodies, but oh my, open up the package and the goodies just call to me. I hope you had a wonderful Granny New Year.